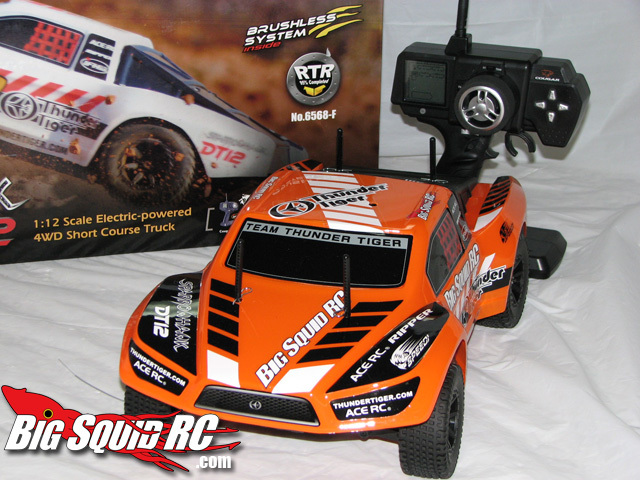 Thunder Tiger Sparrowhawk DT12 Review « Big Squid RC – RC Car and Truck News, Reviews, Videos, and More! Where to Buy: Tower Hobbies, or ask your local hobby shop to get one for you. 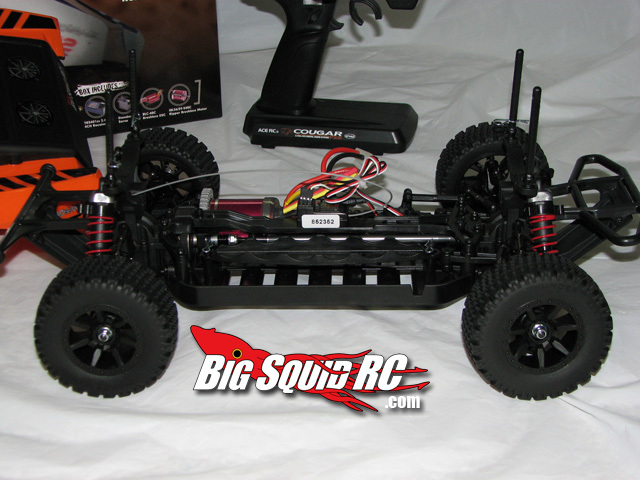 It comes with a ACE RC Cougar 2.4Ghz radio, built and completely ready to run. A few small tools, and manuals for the radio, and truck wrap up the complete package. 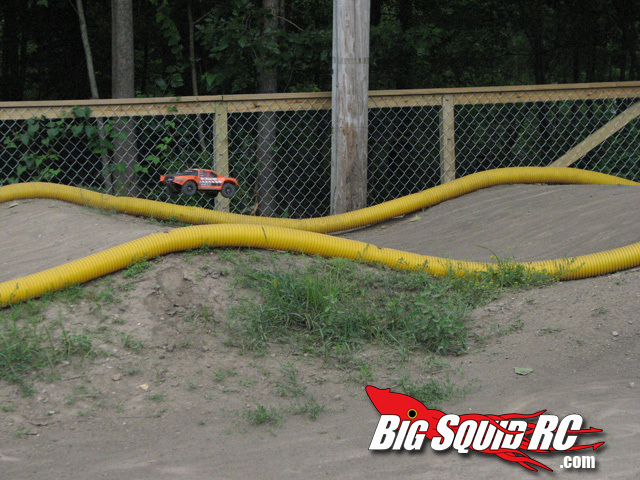 We have been beating it up at most of our local spots, yards, lots, and we also stopped out at the Peoria River City Raceway outdoor track. 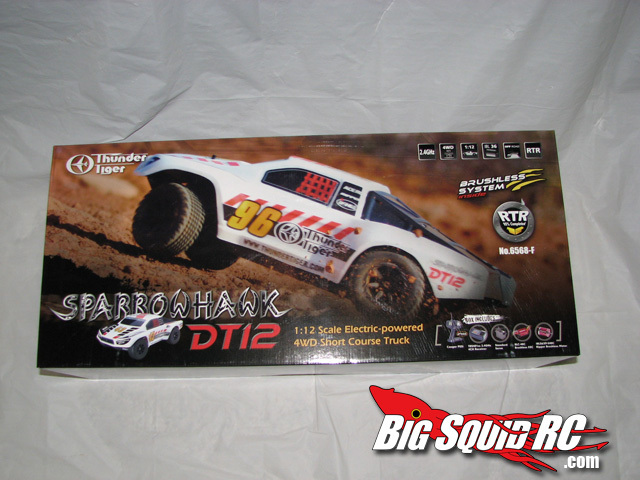 There is only one other 12th scale 4×4 truck that comes to mind, the HPI Mini Trophy Truck, and that truck blew people away with it’s scale looks. The Sparrowhawk DT is a long ways away from the MTT as far as looks or scale realism goes. There is no roll cage, or little people inside driving. What makes the DT what it is, is the body and it’s nothing special to look at. It’s got some tough competition for looks for sure. 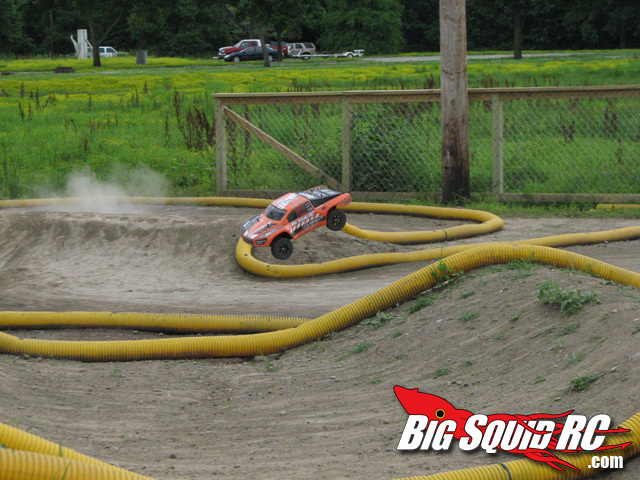 The brushless 3900kv has plenty of power to get the truck moving. 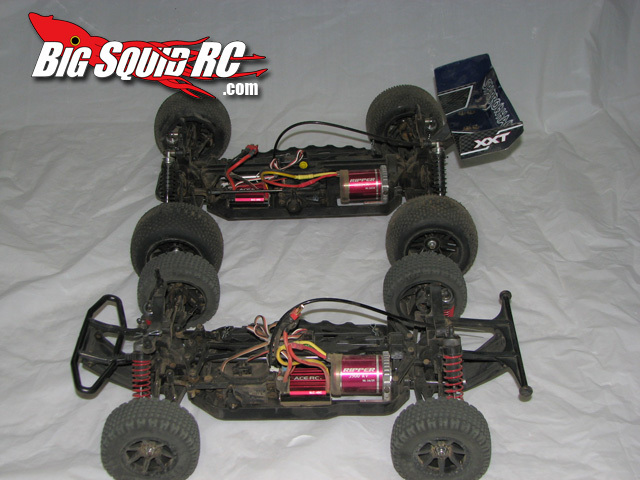 Our 2s Lipo’s had us around 30mph, and on a 3s 40mph easy! 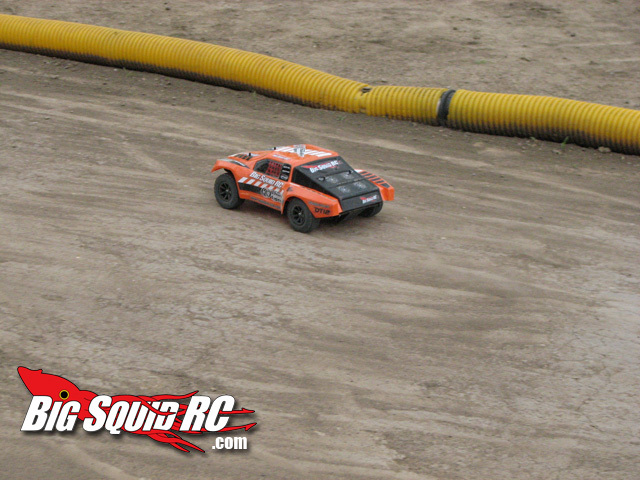 We had no problems with over temperatures and the motor and esc held up to everything we have been throwing at it. 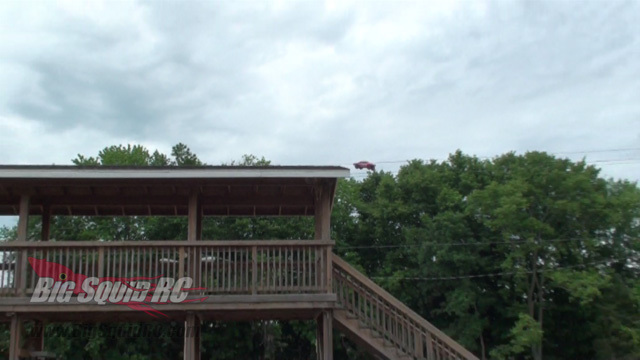 In there air, it’s not quite as controllable as the XXT truck we tested. Because the DT is a little shorter, and narrower with smaller tires, it’s just not as precise. 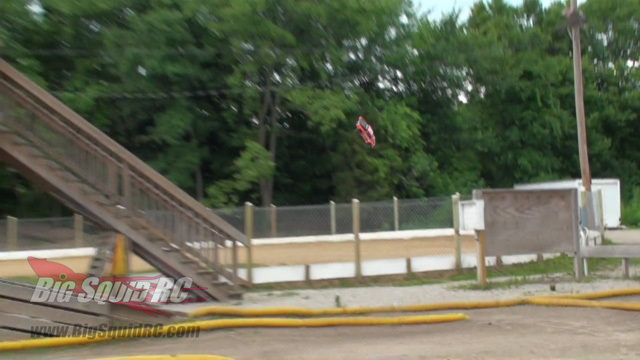 There were no major issues, like it’s not overly front heavy or rear heavy, but we were coming off a lot of jumps nose down, so there was a need to get on the power a little more to keep it flying right. The durability was tested to the extreme. 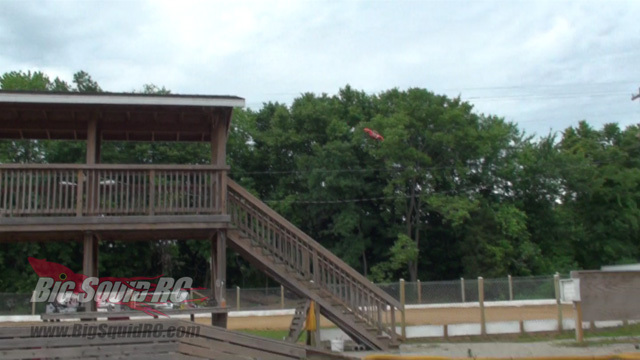 As you can see from the pictures, we got the truck up on the roof of the huge drivers stand at Peoria River City Raceway. The locals all looked at us like we were nuts (we get that a lot when Cubby is around), but we lined it up and proceeded to launch full speed right off the side! While it looked good at first, the truck started to nose down pretty hard and actually landed on the hood of the vehicle, rolling and bouncing another twenty feet. When the dust cleared, Cubby came driving it around the corner and flying over the hills. It survived! We ended up busting the rear body mounts, and pulling two screws through the rear skid plate. Nothing major, and the truck was still driving! I think we were all pretty impressed. The truck has taken many more beatings with big air, and big crashes, and we haven’t had any serious issues. 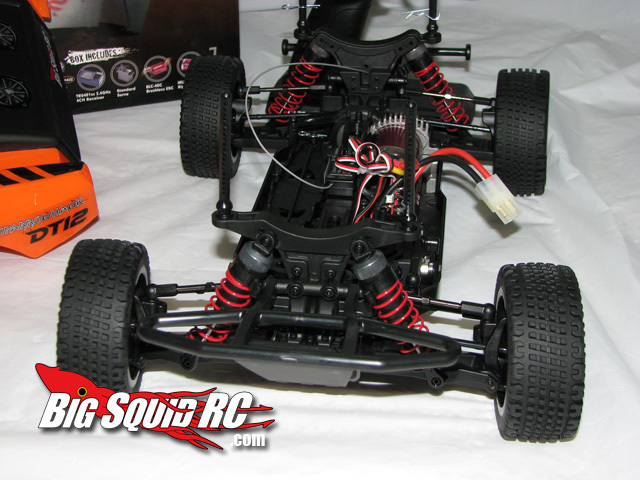 Earlier we compared the looks of the Thunder Tiger DT to the HPI MTT. Well going the opposite way, the Thunder Tiger is a MUCH easier vehicle to work on. All those ‘looks’ don’t get in the way of getting to what you need to when you need to. 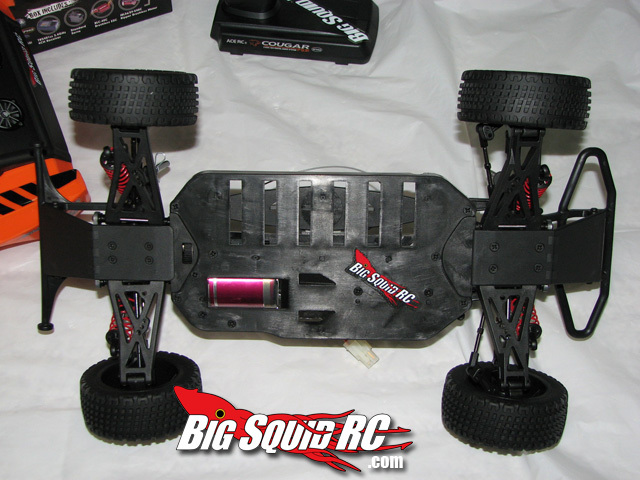 The basic chassis is not too complex. 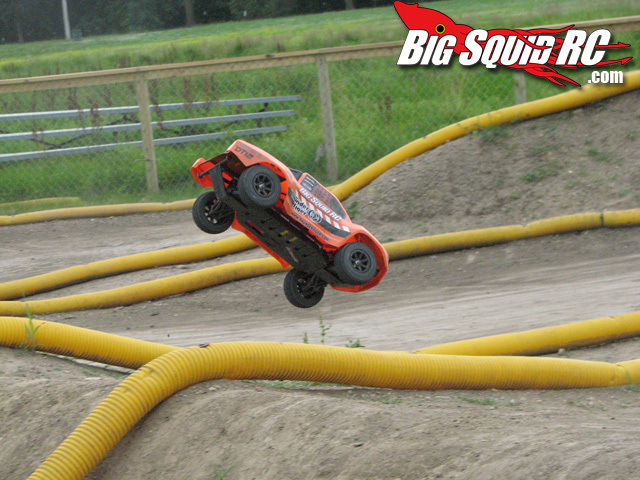 A little more control in the air would be preferable, but the small tires, just don’t allow that to happen. Just like with it’s brother the XXT, we had issues with the center drive shaft. There are a couple of pieces that bolt it together and keep it in place, and these stick out into the area where the battery sits. With NIMH packs we had no issues and the round cells fit fine, but with our larger lipo square packs, the battery can easily rub on these parts causing some trouble. There is a simple fix, so read about that in the mods. The price is a little steep. 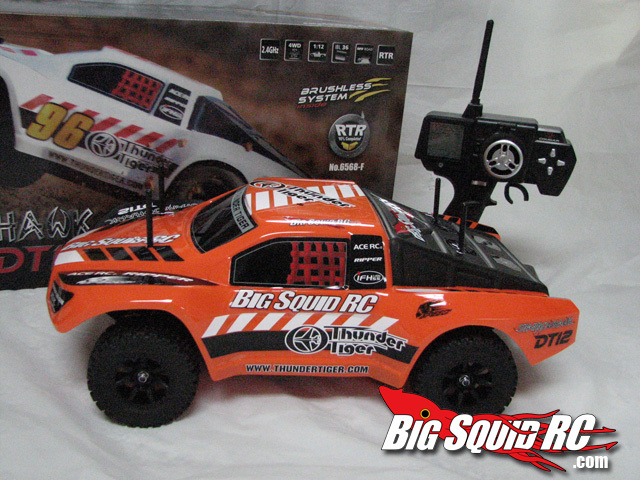 We know it’s a 4×4, and it’s brushless, with a 2.4ghz radio, and it’s plenty durable. You’ll just need to save some extra $$ for this one. Finally the stock 2.4ghz radio is pretty good but not the most intuitive. You’ll be looking at the manual to figure out how to make some simple adjustments, which is never fun. To fix the battery rubbing issues, all you need to do is put something on the bottom brace to push the battery out away from the center drive train. There is room for this, but if you don’t stop the battery from sliding around it will rub. We just took a few plastic washers, and tapped them inside to the brace. These fit below the drive shaft, and push the batter out enough to keep it from rubbing. 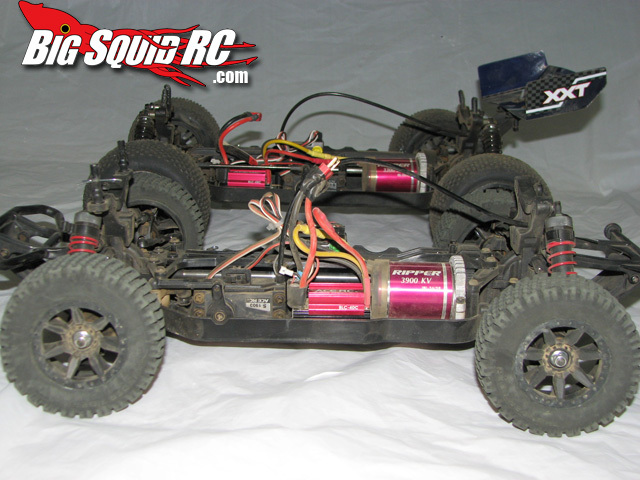 Time To Bash – 9.0/10 – Don’t forget to Mod the battery tray and keep the batteries from rubbing the drive shaft. 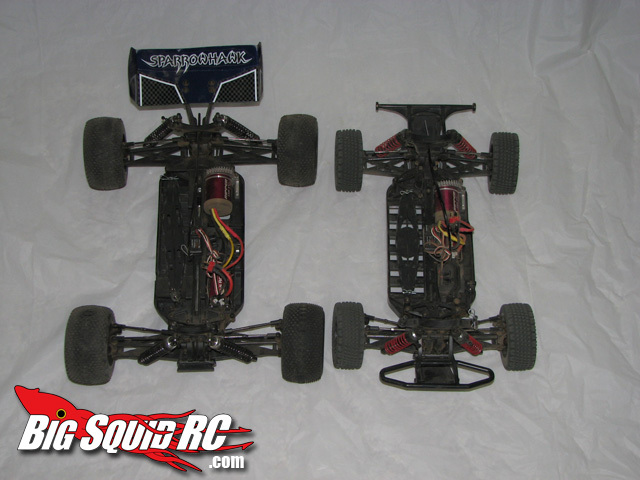 Workability – 8.0/10 – The chassis layout is simple. No roll cage or scale looks to get in the way. There are a few hop ups you can purchase if needed. 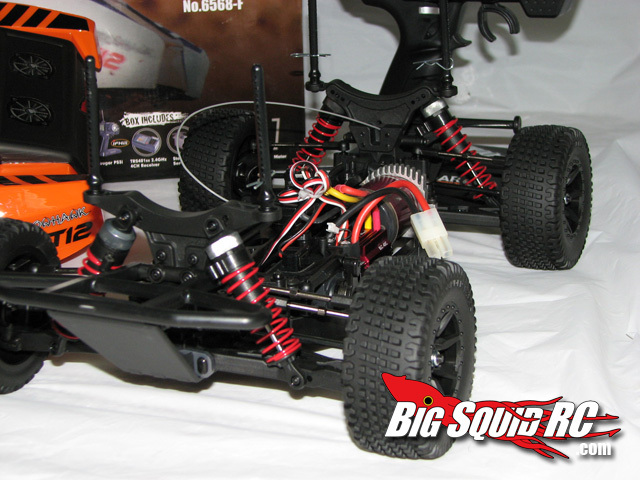 Car Show Rating – 7.0/10 – In comparison to the HPI MTT there is no comparison. It’s no head turner. Bash-A-Bility – 8.5/10 – We hope Thunder Tiger jumps on the waterproof bandwagon soon. The truck has taken a good beating and survived, the metal gears also held up the abuse. 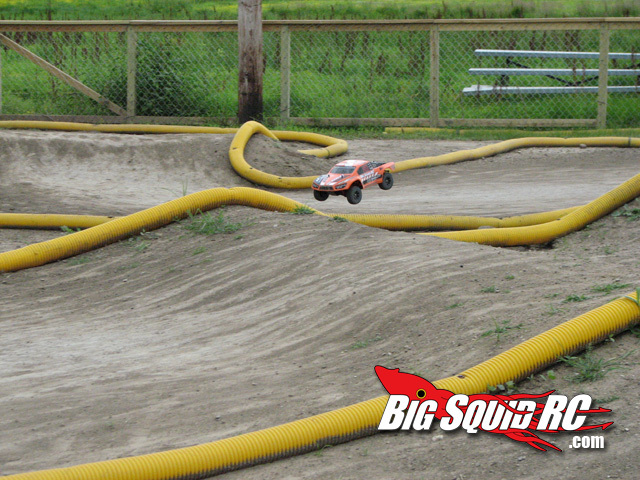 Big Squid Rating – 8.0/10 – Tentacles.. The truck and has plenty of power. It’s not as fun to jump as it’s XXT brother, and not the prettiest 1/12th scale 4×4 on the block, but it’s easy to work on, and can take a beating. 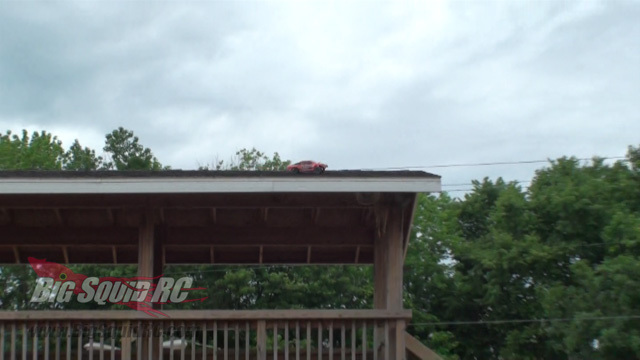 Here’s the video of our roof jump, check it out!